Most people love to own jewelry items. Men and women both like having or owning a jewelry, for men, they keep it as an investment or some consider it as a treasure while women just want to show it to the world like in gatherings and special occasions as an extension of their wardrobe and fashion sense. There are different ways to get it but this article is for those who want to use their computer or laptop to buy one. Jewelry without a doubt is one of the most lucrative and most attractive items traded in an online auction. Now let us discuss how we can get the precious jewelry through online jewelry auction. Jewelry auction site is a great place to search and find brand new and antique jewelry like wedding rings, engagement rings, necklaces, earrings, bracelets, tiara and many more at various prices. It is wise to get or buy a magnificent piece of jewelry at an affordable price. Imagine the cost you will save or the markup you will get from acquiring jewelry at low price, a very good investment indeed. However, it can be unsafe or risky to buy jewelry from unreliable and dubious auction site it is like buying things from a total stranger. So it is important to conduct your own investigation to check out the auction site whether they provide legitimate service or they are just a fraud site. Always check for the site's authenticity before conducting any transactions. These are some of the safety tips for buying jewelry from online auction sites and avoid getting scammed or being ripped off with a fake jewelry. First, Be informed of the jewelry item you're bidding on. You should know the current and actual price of the item you are bidding on the retail market. Be inquisitive and inquire about the item. Many auctioneers have no refund policy for items once it has been sold. So try to exert effort in finding the relevant information on an item before you bid on it. Know about the authenticity of the jewelry posted on online jewelry auction site. You should make sure that the item displayed is the same item you will buy or get. You should check if it is genuine or existing. So ask for the seller for the name of the manufacturer or the maker, the trademark and certification, and any information relevant in determining the item's authenticity. 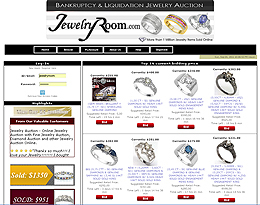 Know the actual price of the item you are bidding on online jewelry auction in the retail or resellers market. So you can have an idea on how much you should bid on this online jewelry auction or how much the auction's last price should be. Many bidders tend to overbid due to excitement and the thrill of the competition. Be wise and restrain yourself from committing these rookie mistakes. You should always set your budget and keep in mind the value of the item you bid on. Inquire about the mode of payment and the standard shipping charges. Credit card is reliable and safe because you can easily report about transactions you didn't made and you can always dispute. Most auction sites prefer Paypal and other online means of payment. Never issue checks or bank to bank transactions and lastly inquire about the standard shipping cost. You should know who will pay for the shipping charge whether the seller on the online jewelry auction site will cover it or it will be added to the last bid price. Ask the auction site about their shipping policy or whether they can ship it to your preferred location. Bidding is fun but always gather enough info before you participate in auction.